It is extremely easy to extend sympathy and kind words to someone who is differently abled and believe one’s duty is done with regard to society. A certain amount of courage and motivation is required to be able to take up arms for those in need of support. In Goa, for years, a physical disability was looked upon as a punishment for iniquities and sins of ancestors. We may have moved long past that attitude but there is still apathy and lack of consideration many a times. The differently abled saw it fit to put their foot down and join forces against the dismissive treatment meted out to them. 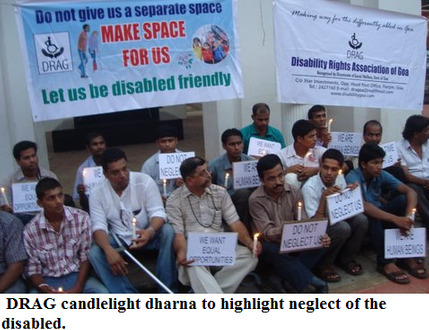 In October, 2003, DRAG or the Disability Rights Association of Goa came into being to ensure that the Persons with Disabilities Act 1995, was applied necessarily. There was the need for resolving issues concerning the differently abled and so it was decided to bring under one banner all such persons and have them work towards a common goal. The NGO was founded by Victor Fernandes, Loretta Velho, Dr Steven Dias, Cleto Godinho, Fatima D’Cunha and Avelino de Sa. Avelino de Sa is a perfect example of a differently abled person being able to perform on par with an individual without any disability. He was born with cerebral palsy and has a bachelor’s degree in Commerce from Dempo College, Panaji. He is, furthermore, a certified investment and tax consultant with his own firm in Panaji for the last twelve years. Besides being the president of DRAG, Avelino de Sa is a member of the North Goa Local Level Committee of the National Trust for Welfare of Persons with Intellectual and Multiple Disabilities and the National Committee for the Protection of Rights for Persons with Disability. Mr De Sa says, ‘The Government has totally neglected persons with disabilities in Goa.’ He bewails the lax approach of the government, especially when it comes to making places more accessible and providing job opportunities to the differently abled. Of the 33,000 individuals with a disability, there are only 9,000 persons registered with the government and availing of the schemes open to them. The most recent of DRAG’s milestones is to obtain an assurance from Minister for Art and Culture, Dayanand Mandrekar, to install a lift in three months at the Menezes Braganza Institute hall, to allow accessibility to the disabled and the elderly. This was the result of a protest held by DRAG members outside the institute. The organisation has served an ultimatum to the State Government to fulfil its promise to make all government buildings and offices accessible to the disabled, which it failed to do by 2008. The deadline given this time is 31st March, 2015, failing which the State Government will be subjected to a contempt of court case filed against it in the Panaji bench of the Bombay High Court. One must be aware that Section 46 of the Persons with Disabilities Act 1995 and Article 9 of the UN Convention on the Rights of Persons with Disabilities, require provision to be made for facilitating the mobility of disabled persons, including wheel chair users, to gain access to all public buildings. A good sign is that there already is one notch in favour of DRAG. The NGO has also progressed in the area of making disabled parking readily available to the differently abled. Although in 2006, there was the Writ Petition No. 539/2004 as per High Court of Bombay at Panaji, which has directives to have reserved parking for persons with disabilities near all government buildings; a notification was not passed to enforce the same. Now through the efforts of DRAG, a notification has been passed and a call has been made to pressurise the somnolent traffic police to enforce the directive. The theme of the campaign is ‘Improve Mobility, Promote Inclusion and Enrich Community’, and will involve having posters informing people about the rights of the disabled and appealing to them to contribute to the inclusion of the disabled in society, thus enriching it. These will be put up in places frequented by the public such as educational institutions, government buildings, places of worship, etc. There will be poster and essay competitions as well as a film festival on concerns related to disabilities, for school and college students, to further publicise the campaign. ‘We hope to make Goa a better place for persons with disabilities, with people realising the importance of persons with disabilities in the community. We hope Goa will become totally accessible for persons with disabilities by next year,’ says Mr Avelino de Sa. We have plenty of successful differently abled persons who surely prove that they are no burden to society. There is Fulrani Kinnalekar, who is a teacher and possesses no limbs. She has been awarded a national award by the National Trust (set up under the National Trust for the Welfare of Persons with Autism, Cerebral Palsy, Mental Retardation and Multiple Disabilities Act) for her achievements as a disabled person. She can sew, paint, embroider and write despite the absence of hands. Cerebral palsy has in no way proven an obstacle to Frederika Menezes’ success as an author of four books. Dr Vithal Rane, who is orthopaedically disabled, is practicing a doctor. It is time we gave the differently abled their due for the merits they possess and do everything in our power to ensure they do not feel alienated or neglected.